Erin handed me a camera a week ago that had gone through some tough times. It had been dropped while on, and the lens assembly was broken and askew. The camera couldn’t recover from it on its own, and so I was brought in to see if I could fix it. Having been able to revive Erin’s camera, which had the misfortune of a drop into sand, and having removed dust from my own camera many times, I took on the job. Since it was already broken, the owner of the camera didn’t have any expectations of getting it back anyway, so it was a riskless job. 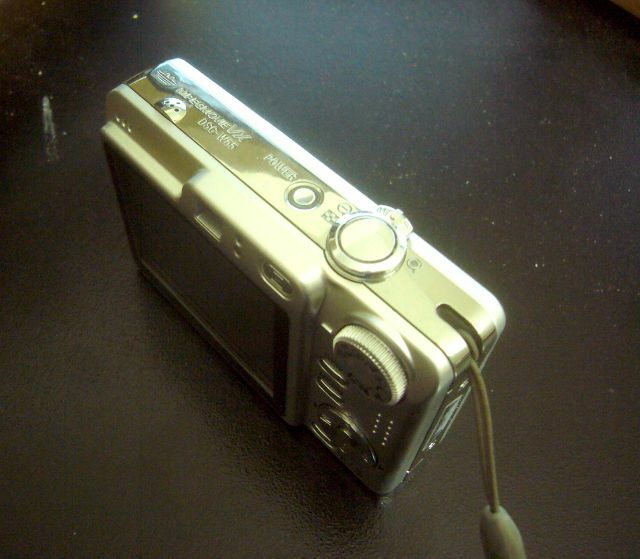 The first image is of the camera, though the lens problem is not visible. 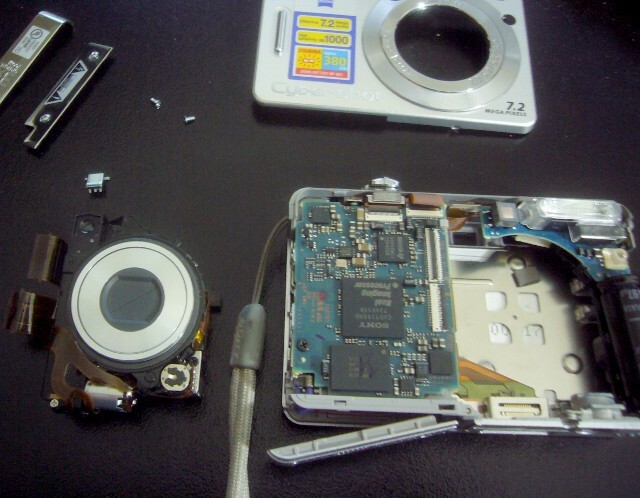 Taking the camera apart was not difficult. There were lots of tiny screws, but for the most part the pieces separated fairly easily. Of course, as I did it I learned little bits about the assembly that made taking it apart easier. 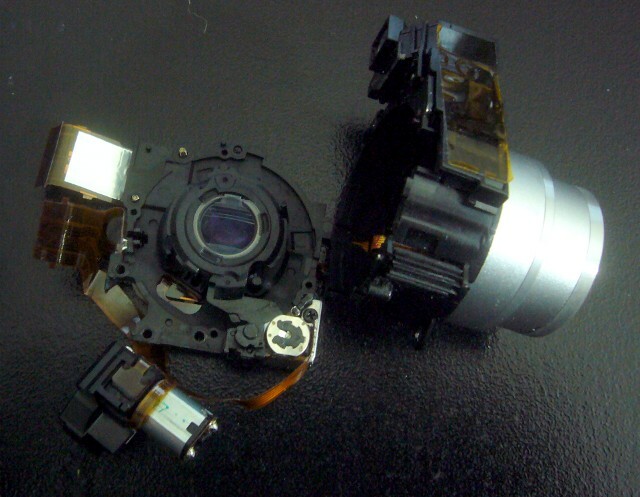 The second picture shows the partially disassembled camera. The lens assembly came out without any screws. The lens assembly out, I was able to partially disassemble it as well. There were two main lenses. The first was the big one in the picture below. The second was the small one in the picture below that. Both were capable of moving. 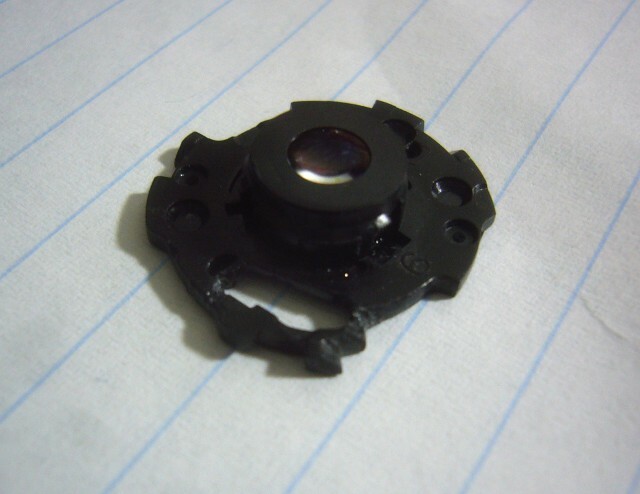 In fact, it was the plastic on the smaller lens that had broken, and was sticking out, preventing the lens assembly from closing back up. 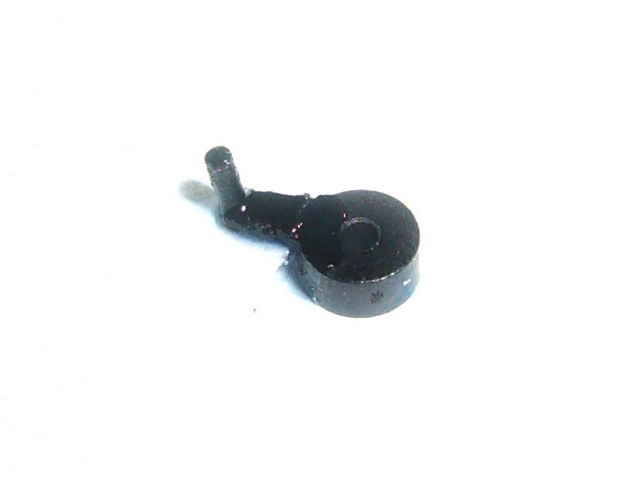 This little piece of plastic, which is the part closest to the camera, turned out to be extremely important. I tried at first to just remove it and reassemble the camera, but it turned out that it wouldn’t focus without it. The piece was essential for guiding the lens forward and back and without it a small spring was pulling it in a direction it shouldn’t have gone. I was able to super glue it back together, but then had to take a small file to remove small jutting slivers that were adding too much friction to the assembly. The hardest part was putting the whole lens assembly together and back apart over and over, which took many minutes each time, and put wear and tear on some components that were only ever meant to be assembled once. In fact, a great deal of time was spent maintaining and guiding parts back together, and resetting springs that had to be unset. I thought that I had been successful and had fixed the camera, but there was a problem. 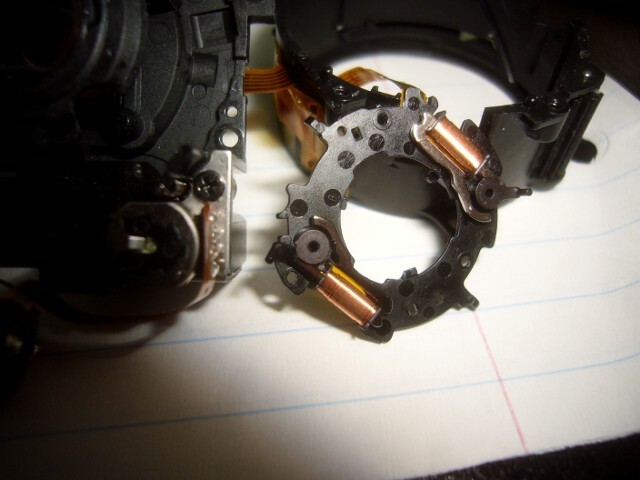 When I took a photo, the iris would stay closed, and it wasn’t until I would dismantle the whole thing that I could reopen the iris. Clearly this would not work in the field. I had to dismantle the assembly further to discover another unfortunate break. The iris is controlled by two extremely small electromagnets, which apply torque to two magnets, which have small arms at the end of them. Those arms push and pull the thin pieces of plastic over the lens to adjust the light levels. Unfortunately, one of the arms was broken on the small magnet. It took a lot of time to work on the camera and figure out how it all fit together. There were a lot of little pieces that had to be assembled just so, and it’s such a shame that the camera is perfectly good except for a few misplaced atoms, and because I won’t be able to find a replacement will now likely be discarded in its entirety.